My Green Chile Chicken Salad is an incredibly easy to make 10-ingredient recipe often requested at gatherings. Mostly because it is full of tender chicken, savory green chilies, and crunchy radishes. All tossed together in a tangy sour cream lime dressing. 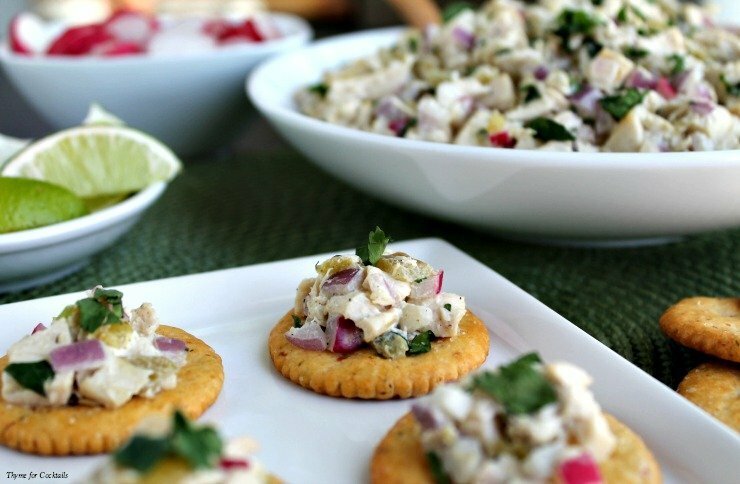 Who knew a pantry staple like canned green chiles could turn traditional chicken salad into a Tex-Mex party favorite?! Most of the peeps in our circle are foodies. Which means parties are typically potluck. This ensures a variety of food we all enjoy. Plus we almost always dine on Southwest inspired dishes. We are not the type to rush through cocktails by the pool. 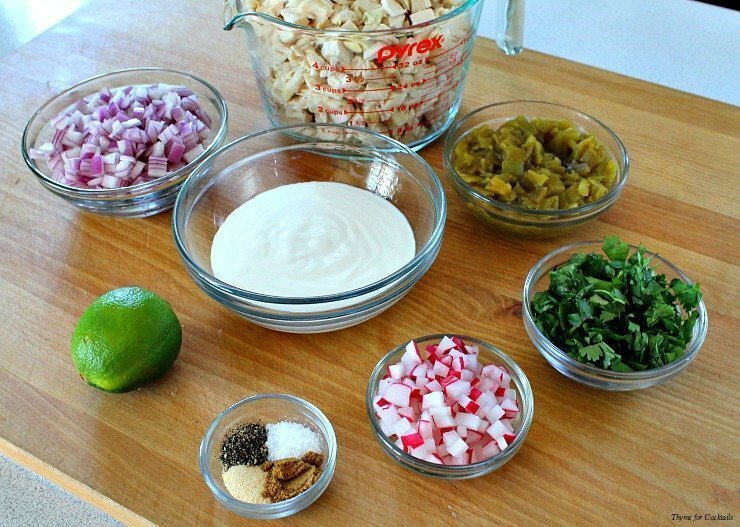 So I like to have munchies on hand like this Green Chile Chicken Salad recipe. It gives everyone something to snack on until it is time for the big meal. We have learned from experience that after a few adult beverages – on an empty stomach – while basking in the sun – we are not real motivated to cook. Too many people are napping! This Green Chile Chicken Salad recipe is best made ahead of time so that the flavors have a chance to mingle and get their cha-cha on. I confess I am not a fan of traditional mayo-heavy salads. Most of my recipes favor lighter dressings that allow the salad ingredients to shine thorough. Sour cream and Greek yogurt are my favorite go-to dressing substitutes. You can mix in all kinds of fresh herbs, vinegars, sweeteners, and spices to achieve delicious flavor combinations. 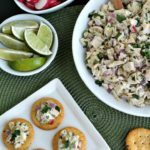 I like to serve sliced radishes and lime wedges along with this Green Chile Chicken Salad so people can customize their snacks. The crunchy bite of the radish compliments the smokey flavor of the green chile while lime juice brightens up the whole affair. Cilantro is a popular garnish that enhances the southwest flavors of the dish. I hope you like this Green Chile Chicken Salad recipe as much as my crew does. If you love this updated classic, you can find more like it by checking out my Salad section! For recipe inspiration delivered to your inbox, subscribe to my newsletter, follow my photography journey on Instagram, and for generally inappropriate humor follow like me on Facebook! In a large bowl add chicken, green chilies, onion and radishes; mix together. In a separate bowl whisk together remaining ingredients. Pour sour cream sauce over chicken mixture, stir to coat thoroughly. Chill until ready to serve. Tip - Green Chile Chicken Salad is best made at least one hour before serving. For max flavor make one day ahead. Chill until ready to serve. I love all the flavors and textures, a great topping for Ritz crackers. It was devoured in 1 day! We always have Ritz crackers in the pantry. 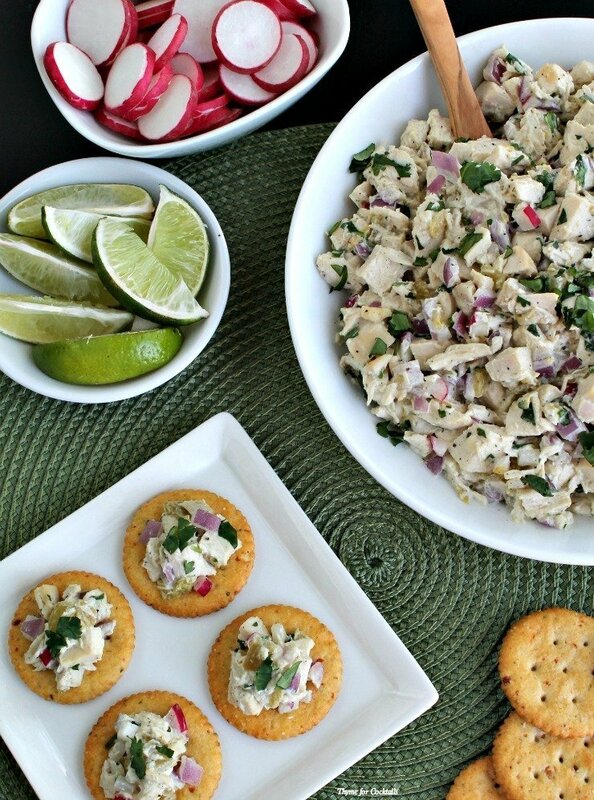 Love your Tex Mex twist on chicken salad! We love the roasted veggie ones! I love the addition of the green chilies. I am in New Mexico now enjoying them too. I like them in so many dishes and this is such a good idea. Thank you Peter! We love them too. We are just starting to get fresh ones at the farmers market. Fantastic appetizer. Love all the color and crunch. Thank you, the radishes really help big an extra crunch! All the ingredients looks so fresh & tasty! Love the cilantro and love the crunch from the Ritz crackers! I love this recipe and am saving it for my next party! They don’t last long around here either! I love the chicken and heat combo of the chili! This looks like a great spread or stuffing for lots of things. So versatile! Sounds like a wonderful chicken salad! Super tangy & lighter than traditional chicken salad! I love the idea of adding radishes to this salad. I’ll have to remember to do that. Anything that fits on a Ritz cracker is going to be good, in my opinion. This looks amazing, perfect appetizer or sandwich spread! Looks so delish! I can imagine this to be a hit at any party! What a lovely salad to serve for either Mother’s Day brunch or dinner! This is a delicious appetizer and great for buffets. This is the kind of salad recipe that proves that salads don’t have to be boring. So easy! This would be prefect for Mother’s Day brunch and summer cook-outs! We had it recently for a pool party! I love adding green chile to recipes to give it a little kick. Fabulous idea! This looks wonderful! What a great party appetizer. I love it! This is such a fun appetizer!